The Second Great Migration, the movement of African Americans between the South and the North that began in the early 1940s and tapered off in the late 1960s, transformed America. This migration of approximately five million people helped improve the financial prospects of black Americans, who, in the next generation, moved increasingly into the middle class. Over seven years, Lisa Krissoff Boehm gathered oral histories with women migrants and their children, two groups largely overlooked in the story of this event. She also utilized existing oral histories with migrants and southerners in leading archives. 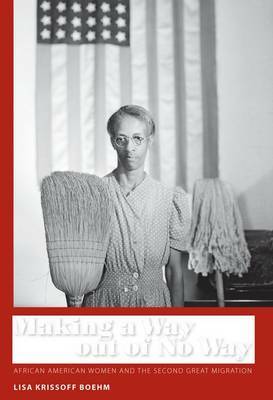 In extended excerpts from the oral histories, and in thoughtful scholarly analysis of the voices, this book offers a unique window into African American women's history. These rich oral histories reveal much that is surprising. Although the Jim Crow South presented persistent dangers, the women retained warm memories of southern childhoods. Notwithstanding the burgeoning war industry, most women found themselves left out of industrial work. The North offered its own institutionalized racism; the region was not the promised land. Additionally, these African American women juggled work and family long before such battles became a staple of mainstream discussion. In the face of challenges, the women who share their tales here crafted lives of great meaning from the limited options available, making a way out of no way.